By this point, you should have gone through the Part-1, Part-2 and Part-3 of this series. In this tutorial, we’ll create the RDS instance inside the VPC that we have created in Part-1 and Security Group created in Part-2 using Ansible. By this point, you should have already read the Part-1 and Part-2 of this series. In this tutorial, we’ll create the EC2 instances inside the VPC that we have created in Part-1, Security Group & EC2 Key Pair created in Part-2 and also add them inside the ELB, all with Ansible. In the second part of this series of tutorials, we’ll create the Security Group and EC2 Key Pair using Ansible. If you didn’t create the VPC already, then please check the Part-1 of this series. 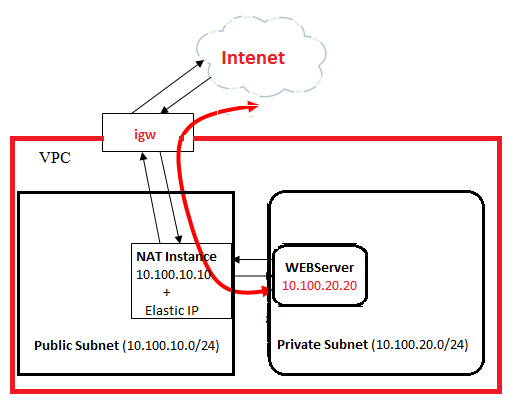 In the above scenario, we’ll create a micro instance inside the public subnet with an IP 10.100.10.0/24, which will act as the gateway for all the instance(s) inside the private subnet (10.100.20.0/24).